WLRN's Tim Padgett has written an essay concerning Yoani Sanchez, the embargo and American hypocrisy that is a remarkable exercise in rhetorical gymnastics. He condemns "hardliners" who support sanctions but praise Yoani Sánchez while in disagreement with her position on sanctions. At the same time Mr. Padgett acknowledges that he knows that "[s]ome Cuban dissidents do support the embargo , and I respect their arguments – especially since they, like Sánchez, are the ones on the ground in Cuba, if not in its jails." If you argue that persons who advocate a pro-sanctions policy cannot admire and respect a person who is anti-sanctions then you cannot claim the opposite that you respect persons who are pro-sanctions even though you have an anti-sanctions position. Or is it that one can only hold a respectable position by being as you say: "on the ground in Cuba, if not in its jails." With that line of argument the only voices that should be listened to are inside the island. One's position on sanctions whether in favor or against would not be based on the best case put forward but on one's geographic location. Sanctions are the last nonviolent way of seeking to change an unjust system by refusing to cooperate with tyranny. When discussing the Cuban embargo in the mass media these two aspects are rarely, if ever, touched upon. Academics and the lobbyists for big business, such as USA Engage, often claim that sanctions never work; rather, it is economic engagement that leads towards greater respect for human rights. However, recent history in China, Burma, and Vietnam indicate otherwise. Out of the three only Burma has seen an improvement in its human rights situation and was subjected to tough sanctions while things have gotten worse in China and Vietnam despite normalized relations and trade. When I met Yoani Sánchez and expressed my admiration for her writings while at the same time my disagreement with her position on economic sanctions she smiled, laughed gently and said that we need to celebrate differences of opinion that it is part of democracy. I am in full agreement with her on that and on the need to "decriminalize discrepancy." The meeting ended with a hug and a kiss on the cheek. People of good will with good intentions can be found on both sides of the sanctions debate. However, people of ill will can also be found on both sides of the debate. A strategy of sanctions that seeks to harm the population into revolt is immoral as is playing the rhetorical humanitarian card to lift sanctions and enter into business with the oppressor. This brings me back to the issue of "America's hypocrisy." Unfortunately, for Americans the hypocrisy is not to be found in the speck that is Cuba but in the plank that is China. June 3, 2014 will mark the 25th anniversary of the beginning of the Tiananmen Square massacre where estimates placed the number of dead at 2,600. At the time the Bush Administration announced a package of cosmetic sanctions while secretly on July 1, 1989 sending a high ranking delegation consisting of Undersecretary of State Lawrence Eagleburger and national security adviser Brent Scowcroft, who met with Deng Xiaoping in Beijing to explain "Bush's view of the importance of the long-term relationship between the US and the Peoples Republic of China." 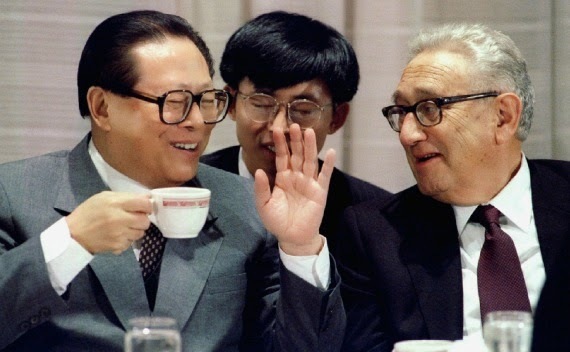 Part of the reason for this approach was a call from Henry Kissinger discarding human rights concerns as "fuzzy-headed liberals/bleeding hearts" whose successful consulting group Kissinger Associates represents companies that deal with China. Scowcroft and Eagleburger returned to Beijing in December 1989 to "explore the possibility of developing a ‘road map’ toward better relations with Chinese leaders." In the meantime, Bush "vetoed legislation permitting Chinese exchange students to remain in the US until the Chinese government improved its human rights record. "In the aftermath of Tiananmen 1,000 Chinese were sentenced to death and executed. On the "plus side" both Scowcroft and Eagleburger were either already in Kissinger Associates or soon would be afterwards and Kissinger Associates (founded in 1982) has done very well over the past twenty five years. Economic interests overrode human rights concerns in China and American hypocrisy over the whole affair wreaks. Twenty five years later most of the rest of the world is following the United States in ignoring human rights in China for economic gain. Meanwhile, in Cuba since the year 2000 American corporations have made more than 4.3 billions dollars on a cash and carry basis with the Castro regime, but they are lobbying for normalized relations so that the Castro regime, a notoriously bad credit risk can obtain tax-payer backed credits. Finally, during the further loosening of sanctions in January of 2011 under the Obama Administration we have seen the phenomenon of high profile opposition leaders such as Oswaldo Payá Sardiñas in 2012, and Laura Inés Pollán Toledo in late 2011 dying under suspicious circumstances. Viewing the Castro regime through the prism of a regime with a close working relationship with both China and North Korea and a history of sponsoring terrorism normalizing relations will not help Yoani Sánchez but place her life in jeopardy. As has happened in China the dictatorship in Cuba will understand that despite the rhetoric of human rights the only thing that interests the United States government are business interests even if they are at the expense of U.S. taxpayers and workers. At that point the lives of many more activists will be at the mercy of the Castro brothers. Nothing can be more striking than the American government's hypocrisy: talking the human rights talk while walking the short term economic interests for influential players walk. Needless to say I don't hold the Chamber of Commerce in high regard. Hopefully, Yoani Sánchez and other Cuban dissidents will survive the consequences of such short sighted policies as those pursued in China if they are applied by the United States in Cuba. This is why one can wish Yoani well, but legitimately disagree with her on lifting sanctions. At the same time one can also hope that Americans will survive what the U.S. government has set in motion in China with American policy.